I meant to write this post last year around this time, but I never did, because let’s face it: frozen spinach doesn’t sound all that exciting. Rhubarb jam is much sexier, or these fancy rhubarb granita cocktails I was obsessed with last year too. Really, though, if you’re trying to grow and preserve your own food (or just eat locally all year long), this project is so important. 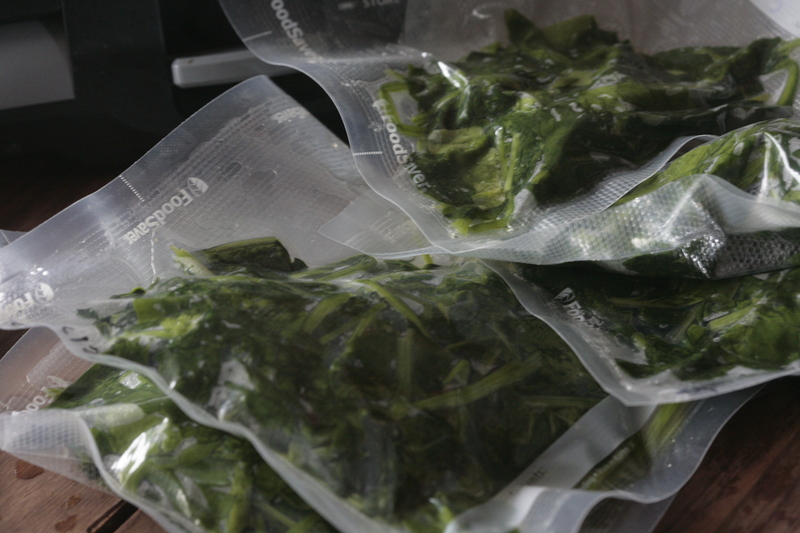 Last spring, I started making a real effort to make packs of greens for the freezer. I get spinach from one of my friends who grows a huge amount of it, but the process works the same for any other dark, leafy green. Kale, chard and collards all do much better when you regularly harvest the big outer leaves. 1. Wash the greens thoroughly. 2. Chop them into whatever size you want them to be later. 3. Blanch them for a minute or two (shorter for spinach, longer for kale or collards). 4. Drain and rinse with cold water (or transfer them to an ice bath if you’re super organized, but I never bother with this. A cold water rinse works fine for me). 5. Vacuum seal or pack the greens into freezer safe ziploc bags for later. I like to make a variety of sizes: some as individual portions to mix with scrambled eggs, and some in big batches for making spanikopitas or other casseroles. If you don’t have a vacuum sealer, it doesn’t really matter, but I think they really work well for the freezer. 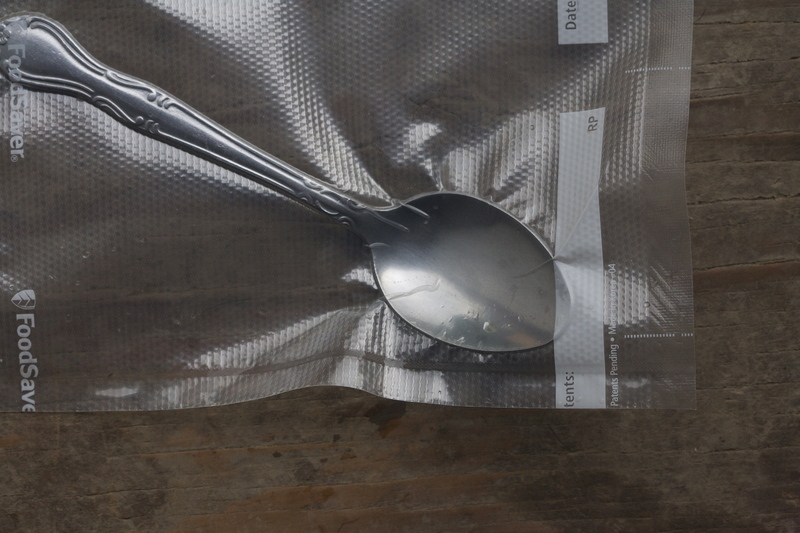 Plus, they’re fun, and you can vacuum seal random stuff like spoons just because it looks cool. The first time I tried doing this, I blanched and froze two bushels of fresh spinach. I was absolutely shocked at how fast we used it and how happy I was to have the packs ready to go in the freezer. I love making jam, but I have problems incorporating it into my regular diet. I don’t really eat bread very often, and I don’t really like eating sugar, so…….. But man, spinach! I started pulling out a bag at night to thaw and then I’d scramble it into some of our eggs in the morning with a little goat cheese. When I eat a scramble like that for breakfast, I feel like a rockstar all day. Plus, when I’m just getting up in the morning there’s no way I’m going out to the garden and to harvest and wash spinach for breakfast, but if all the work is already done, I find eating greens with breakfast every day, which is always a good thing. Frozen greens have absolutely joined canned homegrown tomatoes as a pantry/freezer staple that I like to always have on hand. When I have plenty of time to cook, I’ll walk to the garden and harvest some fresh greens, but when I’m pressed for time (I usually am), the frozen ones really are a life saver. Speaking of pressed for time…. I have a bunch of projects I’ve been making with frozen greens that I want to tell you about, but definitely don’t have photographed since I’m not organized enough right now. I’m posting this today anyway though. You’ll just have to use your imaginations. We made pupusas stuffed with oaxaca cheese and chopped spinach, which were amazing. This is not a picture of the pupusas we made the other day. 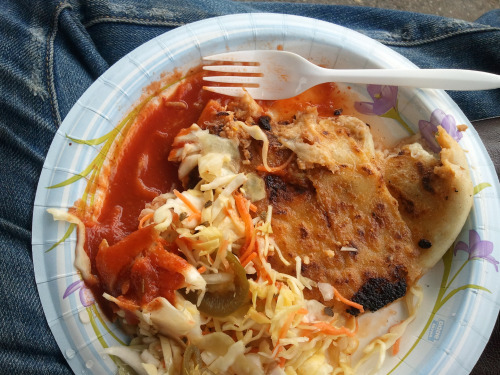 This is a pupusa from a spot in San Francisco that I love, just in case you have no clue what a pupusa is (since a lot of people have never had them before). Ours looked really similar though. The recipe I used is right here, from Saveur. They’re basically homemade tortillas that are stuffed with whatever filling you like. I thought they would be really difficult to make, but the dough comes together very easily and they fry up in just a few minutes. We just changed the filling a little bit, using oaxaca cheese (it’s kind of like a Mexican version of monterey jack or mozzarella) mixed with chopped spinach. I used purple cabbage in the slaw and which made it look cooler than plain old green cabbage. Also, I made fresh spinach pappardelle. I still have some so maybe I’ll get my act together and take some pretty pictures to inspire you to make fresh pasta. For now though…..
Maybe if I drink some more coffee you’ll come back to this post later and there’ll be some more pictures and recipes. We’ll see what happens. Cut this dough into whatever widths you like. I especially like it tossed with pesto, chopped heirloom tomatoes and parmesan cheese. Cook Time: an hour or more, depending how fast you can make pasta. it’s not a fast one. Mound the flour on a clean counter. Make a well in the center, and add the eggs, spinach puree and oil. Using a fork, gradually mix together all the liquid ingredients and begin incorporating the flour from the inside rim of the well. Keep incorporating more and more flour, and once you’ve done as much as you can with the fork, switch to your hands and start kneading it together, trying to work all the ingredients together into a ball. Semolina flour is more difficult to work with than all purpose flour, but if you keep kneading it should eventually come together. Add a little spinach puree if it needs some more moisture. Season the dough with salt, pepper and nutmeg. Once the dough has formed a coherent ball, knead it for about five minutes. Add a little flour if the dough is too sticky. Let the dough rest for 15 minutes, then roll it out using the instructions for whatever pasta maker you have. Once the pasta is cut, you can dry it on hangers and it will store in a cool, dark place for several weeks. It can also be dusted liberally with flour and stored fresh in the refrigerator. *To make the spinach puree, just thaw frozen spinach and then zap it in a blender or food processor. 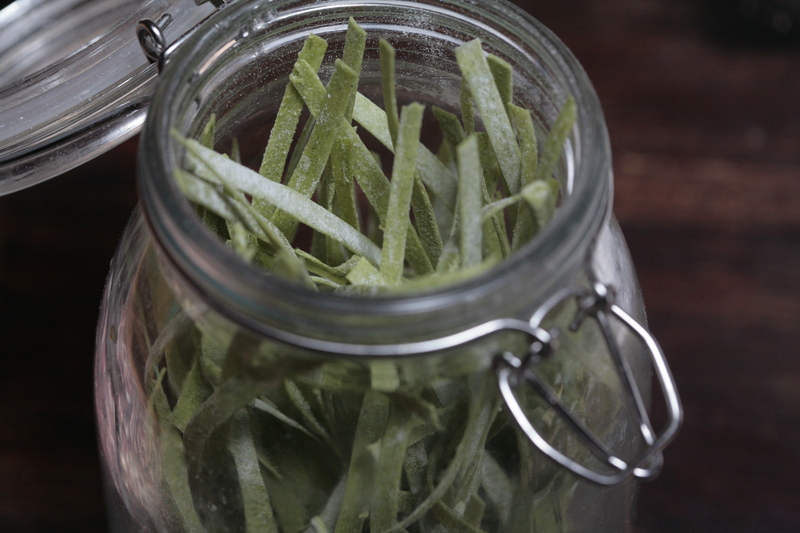 Go harvest the extra greens you have in your garden and freeze them for later! 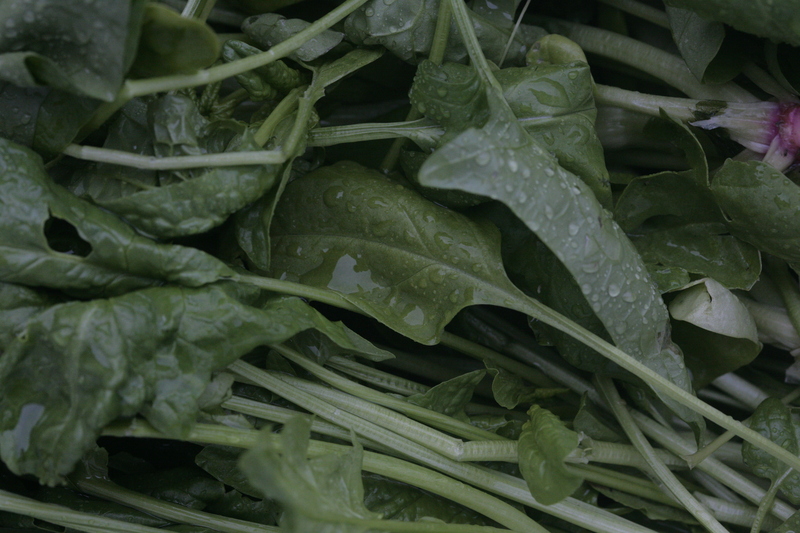 The next time you see gorgeous greens at the farmers market for cheap, buy a bunch and freeze ’em! Do it. You’ll be happy. I feel exactly the same way about processing fresh greens for the freezer! For the last 2 summers, I’ve frozen leaves of chard, dino kale, Portuguese kale, Ragged Jack kale and had meals almost ready made for scrambled eggs, sauteed greens with garlic, amazingly fast and terrific. Only thing I do differently is squeeze my blanched greens in a tea towel and then spread on cookie sheet to flash freeze. When frozen, seal in gallon baggie with air removed. It’s like dinner almost cooks itself! Kudos!!! Last year I froze a ton of kale and collards — but I still haven’t used them. I don’t make enough soups that call for them and I’m not really sure how else to use them, given their yicky consistency once defrosted. If you have more ideas, I’d love to hear them because I *always* grow more greens than we could possibly consume! what about using the kale in fritattas? or quiche? or bake it into spanikopita, or make spinach and artichoke dip but with kale instead of spinach. and the collards are such a good side dish for southern dinners like fried chicken. i would just fry a little diced bacon and then throw in the collards with a splash of cider vinegar. I’m going to try this with dandelions. Harvested two 5 gallon pails and they are beautiful. After reading this post, I decided to harvest the spinach growing in my garden before it bolts. I now have two packets of blanched spinach in the freezer and the swiss chard will be next! Thanks for the post! I do the same with our spinach, kale, and swiss chard. Having all 3 we produce more than we can eat, and if you keep them picked, they keep growing. A few times each year, when the plants get out of control, I will pick all 3, and blanch and freeze. Like mentioned, they are great in omelets, soups, stews, and as a simple side dish. Nothing beats eating greens from the garden in the middle of winter. We did this a bit differently because I’m lazy and ran out of energy for preserving things last summer. I had about fifteen pounds of beets with their greens and the greens are really similar to chard, so I took a bunch of the spinach we had and straight-up froze the combo of the two greens after washing and cutting larger leaves it so it would fit into quart freezer bags. To use it in pasta dishes I don’t even thaw it, I just chop and toss into the skillet with olive oil or tomato sauce and garlic. Add some balsamic vinegar and sundried tomatoes, and it’s completely delish. Batch freezing is our plan when we harvest our veggies this year – we haven’t done it before so thanks for the tips ! Spinach is so good. One of these days I will get around to making my spinach mashed potatoes. Yum.